Baton Rouge, LA – March 23, 2018 – Lamar Advertising Company (Nasdaq: LAMR), one of the largest out of home media companies in the world, today announced that it was recently awarded the ten-year advertising concession for Southern California’s prestigious John Wayne Airport (SNA). Under the contract, Lamar will launch a new comprehensive airport advertising program, including expanded digital advertising displays within SNA’s terminals. John Wayne served over 10 million passengers in 2017 with more than 20 nonstop destinations in the United States, Canada and Mexico. Lamar operates advertising concessions at 22 airports across the U.S. that serve more than 160 million passengers annually. “We’re excited to partner with Orange County and John Wayne Airport as this new program grows to its full potential,” said Sean Reilly, CEO of Lamar Advertising. For more information, please visit www.LamarAirports.com. Founded in 1902, Lamar Advertising Company (Nasdaq: LAMR) is one of the largest outdoor advertising companies in the world, with more than 340,000 displays across the United States, Canada and Puerto Rico. 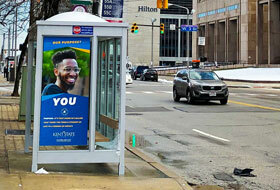 Lamar offers advertisers a variety of billboard, interstate logo, transit and airport advertising formats, helping both local businesses and national brands reach broad audiences every day. 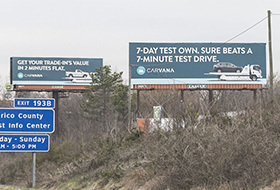 In addition to its more traditional out-of-home inventory, Lamar is proud to offer its customers the largest network of digital billboards in the United States with over 2,800 displays. Please feel free to explore our website www.lamar.com or contact us at hello@lamar.com for additional information.